Finely grate the zest of the orange, and set it aside. Segment the orange (removing pulp and skin), and keep the sections and juice in a bowl. In large cast-iron skillet or saute pan, heat 2 tsp olive oil over high heat, swirling it around to coat the bottom thinly and evenly. When the oil begins to smoke, add the beans (in batches if necessary – don’t crowd the pan) and scatter 1/2 tsp of the salt over them. Cook, stirring only every 2 minutes, until the beans are half blistered and blackened – about 8 minutes. Transfer beans to serving platter or bowl. 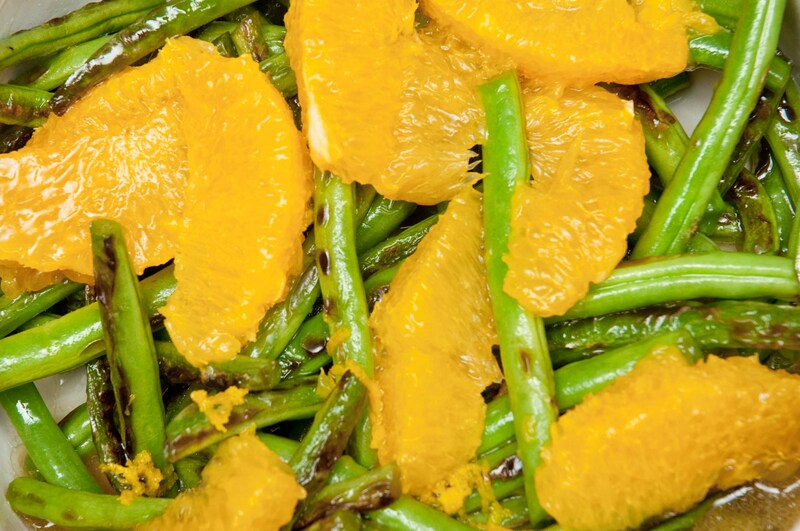 Lift the orange segments out of their juice (reserve juice), and scatter them over beans. Sprinkle 1/4 tsp of the orange zest over the beans and oranges. Add the vinegar, olive oil, and remaining 1/4 tsp salt to the bowl of orange juice, and whisk until thoroughly combined. Pour the dressing over the beans. Toss, and season to taste with salt, black pepper, and the remaining orange zest.